In a double boiler, whisk together 1/2 C. sugar, flour and salt. Add in the milk and cook over boiling water, stirring constantly, until it thickens (about 10-12 minutes). Whisk in the 3 egg yolks and cook for an additional 3 minutes. Remove from heat, stir in the vanilla. 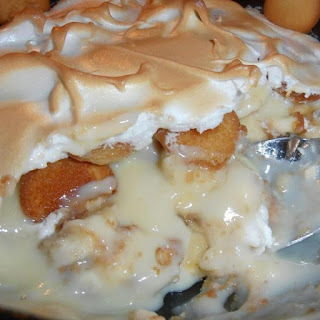 In a 1 1/2 quart casserole, place a layer of the wafers on the bottom, top with a layer of bananas and 1/3 of the custard. Continue repeating for 3 layers, ending with custard. In a bowl, beat the egg whites until stiff peaks form, gradually adding in the 1/4 C. sugar and cream of tartar. Spoon meringue over the top and place in a 425 degree oven for 5 minutes or until topping is lightly browned. Remove and garnish with more vanilla wafers around the edges. Let cool slightly and serve or refrigerate. (I like mine served warm).